Interestingly enough I am writing this not from Turkey but while visiting Bosnia and Herzegovina. Well, a short and sweet romance does not question the long-term commitment, right? After the first cup of coffee in Mostar and a stroll down the medieval quarters of once Ottoman-ruled town I fell in love with Bosnia and Herzegovina. Mostar used to be just a tiny settlement with 19 houses before the Turks came in the 15th century. The Ottomans built the town to take advantage of the fertile valley separated from the Adriatic coast by the Dinaric Alps. Mostar soon became a strong commercial center trading with Dubrovnik and other coastal cities in the Dalmatia: fish, olive oil and linens would be carried inland while wool, meat, honey and oats would be shipped to the coast. The name of the town comes from word "mostari", a bridge keeper, since the 20 bridge the Ottomans built across the Neretva river played a key role in connecting various parts of the town and sustaining the trade. Once the Ottoman empire weakened the Austrians took over and later after the Second World War Mostar became a part of Yugoslavia. The town was heavily destroyed by the bombing during the recent war and the signs of the tragedy are still very visible throughout the city. Luckily for the tourist crowds hungry for impressions and discoveries what remained and was restored in the old city make for a very atmospheric medieval Ottoman quarters. Here you can wonder along the bazaar lanes stuffed with goods (just for the sake of the atmosphere let's ignore the fact that the caravans these days come from China), humbly walk barefoot on the furry Oriental carpets of the small mosques, sit on a low bench at the old Turkish house and marvel the deep emerald waters of the Neretva river flowing under your windows, walk back and forth the iconic Stari Most (Old Bridge), listen to ezan, or call for the prayer, and endlessly sip Turkish coffee - black as hell, strong as death, and sweet as love. The way they serve it here in Mostar is as authentic as the remaining bricks of the old Ottoman houses. I have had quite a few of cups of coffee before I found the place which does it perfectly and they were happy to share the Bosnian coffee making wisdom. Bowl fresh water in a kettle. Put three table spoons of ground coffee in the džezva and pour in about 30 ml boiled water over it. Put the džezva on the moderate heat and cook by continuously stirring the coffee the trick is to let a thick foam to form but not to let the coffee boil. Once done - put aside for half a minute. Add more hot water to the džezva and serve. While the preparation may be just a shortcut to the much more complex Turkish method the way they serve coffee in Bosnia and Herzegovina has nothing to do with shortcuts: it is a ceremony that can't be rushed and requires all the seriousness to accomplish. 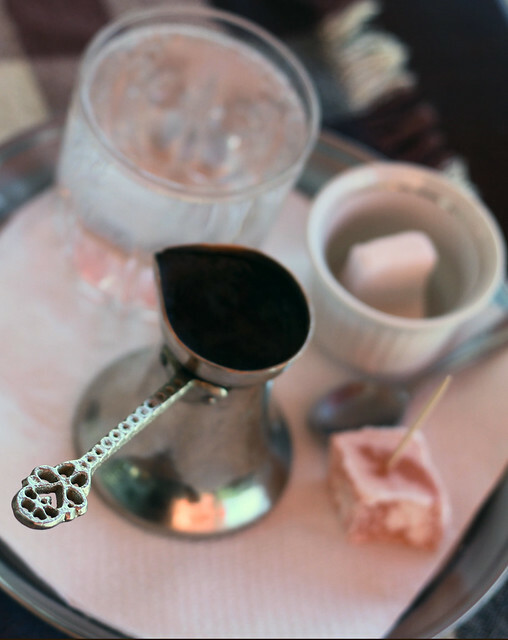 Your coffee will come on a tray with the džezva, fildžan, a tiny bell-shaped cup, a glass of cold water, two large sugar cubes and a peace of Turkish delight on a tooth stick. Start with stirring the foam in the džezva until it turns caramel color, skim it and put into a cup. Gently lift the džezva and without much shaking pour out the coffee in your cup. Make sure to leave a rather solid layer of coffee in the džezva: the coffee grounds at the bottom may be good to tell fortune but no fun to drink. To be ultimately authentic you should drink your coffee by dipping the sugar cubes in it and eating them; it is ok to let the sugar dissolve and sip sweet coffee rather than eating coffee-dipped sugar. Allow the coffee grounds to settle to the bottom of the cup and sip gently. If fact, you should not hesitate to slurp as the coffee is hot plus slurping in a known technique used by professional tasters - the mixture of air and the coffee will let you feel the full aroma in your mouth with very small quantities of coffee. Hold fildžan by the outer rim otherwise you may burn your fingers. Sometime the fildžan is served in a copper holder to keep your coffee hot - it should remains on the table when you sip our coffee. 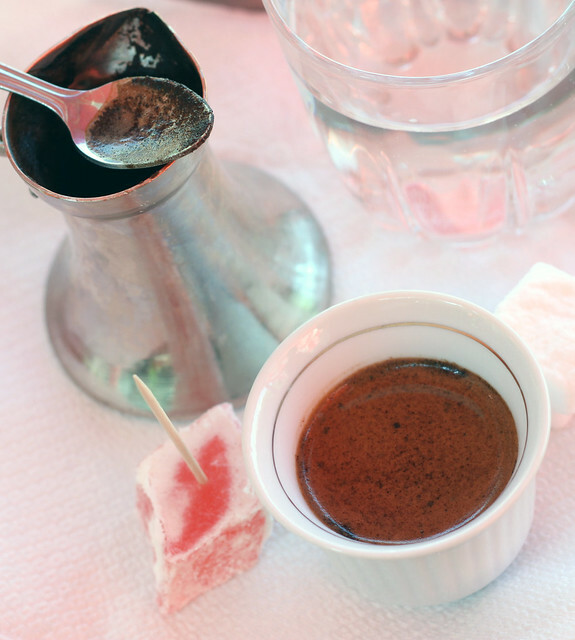 A piece of Turkish delight, or rahatlokum, is a wonderful laconic addition to your coffee. Happy coffee drinking and I am off for a cup of mine.